I have accidentally bought one of these. The forum search doesn't appear to be working for me, giving a 404 error. It's the 1st version produced (16e/13g); minimum focus distance 1.6m (5.25ft), supposedly a Tokina design. Does that mean the glass was also Tokina made? Or, did Minolta melt the glass in their own facility, and coat it using their own Achromatic Coating? Curious... There's also the Olympus 35-105 F3.5-4.5 that's 16e/12g, that's an original Olympus design however they produced a 2nd version with serial >500,000 which has a recessed and convex rear element (similar to the 1st version Minolta) but I haven't found any other information or a lens scheme on that. Any Olympus collectors know more? Anyway, I will have it soon, but I'm curious to see any images or comments on this lens in the meantime. If anyone has a user/owner's manual for this lens, it would be interesting to see it. Normally, even on digital, I'm strictly a user of primes, but I've read that some of these old zooms can be the equals or better of their prime counterparts, at least as far as sharpness goes. Thanks for the links Visualopsins, but they appear to refer to the 2nd version which is a unique Minolta design and seems to be much more common second-hand. The original Tokina has not much information and mixed reviews. The fact the 2nd version can produce a fairly equal image against a modern zoom on the Olympus 4/3 camera is impressive. The two Minolta MD-III 35-105mm designs perform fairly comparable, at least at infinity (i haven't checked them at closer distances). The first (16L) version has in fact exactly the same shape & size of reflections as the corresponding Tokina lens, thus suggesting the same optical computation. Coating hovewer clearly is different. And the performance of my Tokina is visibly inferior to the Minolta!! Probably a tighter quality control at Minolta or (at Tokina) for Minolta ...? I do have the Olympus as well. It is smaller, but both Minoltas are better. Could it not be this lens design? Given it has the Minolta coating, I'd guess they just bought the blanks and did everything in-house in order to achieve the better quality control. I'm curious why the Minolta is F4.5 and not F4.3. I guess it would be T4.5 at F4.3, or they have limited the aperture slightly with a different internal assembly? The Tokina which I actually own - in garbage condition - does not have half-click stops unlike Minolta lenses even though it is in Minolta mount, so that may be all it is. I'm glad to know that it's not a bad lens and may in fact rate as quite a good lens (at least for the Minolta!). I'm patiently waiting for it to arrive. All images I've seen from the Tokina indicate very smooth bokeh but sometimes low contrast and vignetting and smearing in the extreme corners - otherwise quite a sharp lens. It does have 8mm of built-in extension which make the ratio at MFD 1.6m: 1:4 at 35mm and, 1:6.5 at 135mm - about the same as a regular 35mm lens at MFD 0.3m. Which Olympus lens do you have, 1st or 2nd type? Yes, they're the same but the Minolta is apparently just made better - not a direct rebadge. Given it has the Minolta coating, I'd guess they just bought the blanks and did everything in-house in order to achieve the better quality control. I'm curious why the Minolta is F4.5 and not F4.3. I guess it would be T4.5 at F4.3, or they have limited the aperture slightly with a different internal assembly? Probably the effective (geometric) aperture is around f4.5 or even f4.6. Tokina chose - for obvious marketing reasons - to sell it as "f4.3", which still is within the usual +/- 5% tolerances. The same basic construction was sold also by other manufacturers such as Pentax. My RMC 3.5-4.3/35-105 lenses (i have more than one copy) have stronger smearing in the corners than my MD-III 35-105mm [16L]. And all the Tokinas are visibly de-centered: some corners are OK, others corners on the same lens are worse. A very respected Swiss photographer (who managed to finance the construction of his own proprietary large format camera for about 1'000'000 CHF) told me an astonishing story from the late 1970/early 1980: He was invited to visit several Japanes companies, among them Tamron. There he witnessed the "original" Macro lenses (i. e. the Canon FD, Nikkor Ai, and Minolta MD macro lenses!!) being produced within the same room. I was a bis sceptical, but he was adamant about what he had seen. I would guess that Tokina in fact did produce the early 35-105mm, but that's just my guess, and not a proven fact! I don't know. I even didn't know there are two different versions as well...! That's an interesting historical account, Stephan. Many Chinese factories welcome visitors and tourists to show off their capabilities nowadays in the same way. Probably there, we would see the same going on. The global economy is more interconnected than ever before. We are always joking that the expensive name-brand foods and the dollar home-brand foods are probably processed through the same facilities overseas. Though for lenses, I would not think that Tokina would have made the same lens in the same factory to two (or more) markedly different standards. Quality control standards should be followed through at all checkpoints of production in order to be effective. I just measured the entrance pupil on the Tokina at 105mm wide open by imaging it from a distance, and it is roughly 22.15mm = F4.74. At 35mm, 9.33mm = F3.75. Using the same method I checked against the following: an MC-I 35/1.8 returned F1.95 and a MC-X 135/2.8 returned F2.95. This gives a measuring error of 8.33% and 5.36%. So the Minolta's 35-105 suggested aperture of 4.5 is more within the error range to F4.74 as measured, at 5.55% vs 10.47%. Curiously I also measured the MC 100/2 and got the beautiful surprise of F2.036! I took another image at a farther distance and recorded F2.046. Due to the primitive coatings and therefore weaker transmission, I guess they could not afford to make the aperture smaller. It does also give the same shutter speed at F2 compared with the MC-X 50/1.4, even with all of the vignetting. I did a small test comparing the following lenses at 35mm / 50mm / 105mm and wide open, f5.6, and f11, checking corner performance at infinity. Camera: Sony A7 (24MP FF). The Oly is the smallest, but clearly gives the worst results. The Canon is a better, and nearly as good as the Minolta [14L]. Minolta and Tokina RMC [16L] are the best. The two latter lenses perform quite remarkably, e. g. corners are very good even wide open at f=35mm! As you may have noticed, this time (with a "new" Tokina RMC & adapter combination), the Tokina performs as well as the Minolta. Obviously there is sample variation among the Tokina zooms, something i did not observe when comparing eight Minolta MD 3.5/35-70mm and seven Minolta AF 4-4.5/28-135mm zooms. Just measure the clear view in the image. Isn't the measurement of T-stop rather than F-stop? The entrance pupil may, as i have written above, be within the lens. But i ma be also quite a bit outside ... Since we usually don't know the exact location, we cannot measure / calculate the exact distance between sensor and entrance pupil. Therefore, of course, also the exact dieameter of the entrance pupil cannot be "measured". Certainly not exact but not far from it. The error is very small. WYSIWYG? In the case of the Leica R 4/180mm and an earlier version of the Leica R 2.8/180mm the entrace pupils have quite different positions, in spite of both lenses being 180mm lenses (about 10 cm difference, as far as i remember - i'll have to check the literature at home). This means >5% deviation in effective entrance pupil diameter, and consequently >5% error when estimating the diameter according to your method. Very useful knowledge. Thanks for doing that. It's still interesting to me that the 16e lenses perform best in the corners. Did you notice any weaknesses of the Minolta and Tokina, that the others do better? You're right. The F-stop is usually given by the entrance-pupil diameter, as that is the aperture which limits the front group and can be a virtual or real image, but most of the time is virtual as you suggest. The F-stop is therefore the relationship of the entrance-pupil and the "physical aperture" (should be the equivalent meaning of "geometrische Öffnung") by the magnification of the front group. All light in the optical system must pass through both the entrance pupil and the exit pupil - which determines illumination. The ambiguity of the entrance pupil (because we can't correctly measure it) could actually mean the given F-stop for the lenses are true - but that doesn't help to answer the question of the difference in true aperture of the Minolta or Tokina. By attempting to visualise the diameter of the image from the front to the back, through the exit pupil, we see the diameter the light passes through. We don't have to deal with the pupil magnification (ratio of entrance and exit pupils, regarding effective aperture), so it's a decent approximation. Anyway, at 105mm the entrance pupil is slightly larger than the exit-pupil, so the effective aperture must be slightly less than F4.74. Certainly the Minolta MD-III 35-105mm [14L] has a good bokeh @ 3.5/105mm and 1.5m focal distance (where you usually would do portraits). I haven't tested the others, though. I see, thanks again. I'm patiently waiting for its arrival this week. 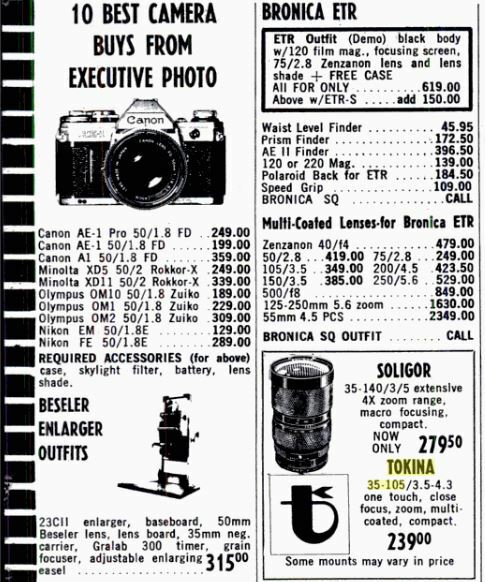 It wasn't a cheap lens back in 1981... The Vivitar Series 1 70-210 F3.5 Macro is listed below it at only $209.